If Windows Task Manager doesn't have a menu or tabs, then it is probably running in what's called "Tiny Footprint" mode. Windows Task Manager has a mode that maximizes the data display by hiding the menu and title bar. It's easy to accidentally get Task Manager into that mode. It's just as easy to get it out. This is what you normally see when you open Task Manager. It varies slightly from version to version of Windows, but the issue that we're dealing with here has not. Note that there is no menu bar or window title bar. This is the so-called "tiny footprint"† mode. This is actually a toggle - double-click in normal mode and you'll get tiny footprint. Double-click in tiny footprint and you'll get normal. Typically, that's the accident that got you here - somehow, the window was double-clicked on. There's actually a Knowledgebase Article on it, based on Windows XP. † No, I don't know why it's called "tiny footprint". It's certainly not smaller; in fact, the displayed data takes up more, not less, of the display area. Perhaps the idea is that you can then resize the tiny footprint window to be significantly smaller and still display meaningful data. Where is Task Manager? Task Manager can be found or started in a couple different places in Windows. Why is my Task Manager disabled, and how do I fix it? Task manager can be disabled manually, but more commonly it's disabled by a virus. It's easy to re-enable once you're virus-free. 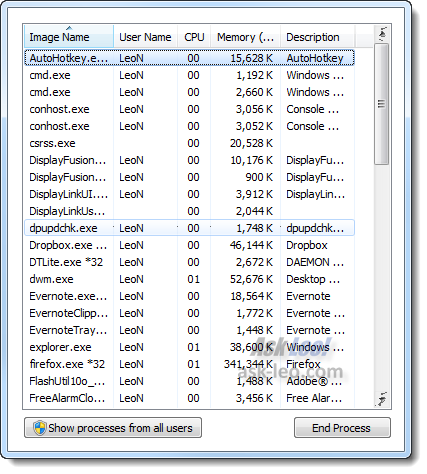 Process Explorer - A Free Powerful Replacement for Windows Task Manager Process Explorer is Task Manager on steroids. A free utility that completely replaces Task Manager, there's no reason not to have and use procexp. The menu bar and tabs may not be visible in Task Manager. This behavior may occur if Task Manager is running in Tiny Footprint mode. If you double-click the empty space in the border around the tabs, Task Manager switches to this mode. To switch Task Manager to its typical display mode, double-click the top border of the window. When Task Manager is running in Tiny Footprint mode, you can resize the window. Thank you. Thank you. Thank you. I REALLY like your site- so helpful. I cannot get TASK MANAGER to open at all! What would cause this? What happens when you try? What happens when you Start->Run and type in "taskmgr" and press OK? I have the same problem mahen has its says another program is currently using this file. what can i do? It could have just had a box for (advanced) I looked for a while before double clicking on the border. Do other windows processes share that feature, meaning you have to guess when to click the border to get the advanced settings? my task bar is at the bottom of my screen, i used to be able to open a program, minimize it and see it in the task bar - now it is always empty and when i minamize a program, i have no way to retrieve it. what do i do? It's too simple just double click on any where on the task manager window & u ill get back ur Task manager Menu or Tabs. "It's too simple just double click on any where on the task manager window & u ill get back ur Task manager Menu or Tabs." Thanks a lot! It actually worked..................its been driving me nuts! for almost 3 months. I am soooo happy. I love it when things are so simple. Thanks for the advice. You're a genuis. How does Task menager inter this "Tiny Footprint Mode" by himself? lol! I thought my task manager is infected with a virus because ive lost the title bar,menu and tabs..
"double click anywhere in the form of task manager is the solution". What the! hmms . i can't even open my task manager , and solutions ? I was going to do a clean install to get my Task Manager back!!!!!!!! Thank You Leo for such a simply wonderful easy fix. Thanks for the wonderful advice. You have no idea what was going thru my mind when the tabs disappeared! I figurerd for sure it was a virus. Thanks! I am going to tell everyone I fixed it myself. Just another reader grateful to have found this article. Thank you, and thank you Google menu bar suggestions feature. my computer does not open task maneager only apears a blank blue screen and when i make alt+ctrl+del apears the message 'TASK MANAGER HAS BEEN DESACTIVATED BY ADMINITRATOR' and does nothing. I have already reinstalled windows xp home and nothing seems to resolve it. That's malware of some sort, and you must be getting infected again after your reinstall. Make sure your anti-virus and anti-spyware scans are happening and above all up to date. 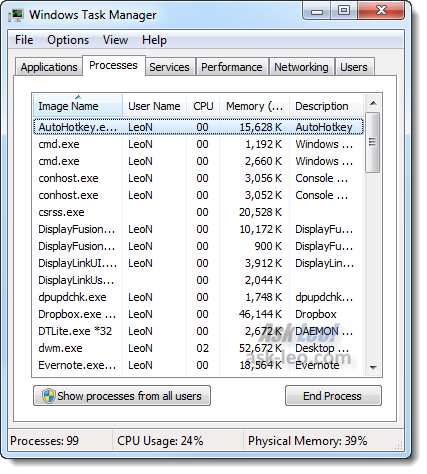 Then have a look at this article: Why is my Task Manager disabled, and how do I fix it? That has been bugging me for so long and it was so simple to resolve! Thanks! Thanks!!! I was already thinking about having to do a clean windows install to fix this. Wow, what a F'd up feature is that. It makes you wonder what else you shouldn't double-click on. jajajaj, It was driving me crazy LOL. THANKS!!! Wow. Sometimes you think you know what you're doing, and then something like this stumps you. Thanks! never even heard of this mode or option and i've been running xp pro since day 1. how stupid. and i thought i had some crazy virus. Great Stuff, i really thought it was a virus too.. but was planning to restore the system to later date... has this failed i really paniced ... scanned the whole system nothing found. when released that i need the online help to see if i fix the problem. UNBELIEVABLE!! "Typical" Microsoft 'send-u-in-the-bush' fun by BGee. Just like this one: "click start button to shutdown pc". Duhhh! on the MS support site and local help files for this bug. Just by chance out of (google) millions, I click on Leo's page(is he dutch just like I am?) and find, "Why does Task Manager suddenly have no Menu or Tabs?" Absolutely fabulous here but why not possible on the MS support page. Typical HUH!? Btw, why did this problem occur on my pc anyway? I did not initiate it!? 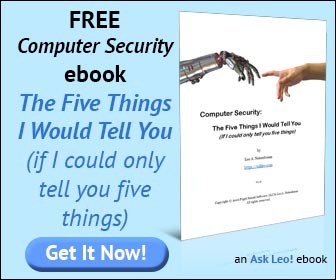 I click the link, 'knowledgebase article', and Leo sends me directly to that page below. WOW!! Your site Leo, is bookmarked. But then the solution, "mijn broek zakt er van af", translation: "my pants really dropped on my ankles". So stupid it is... 'just double click the top bar of the window pane'. Tip to Leo: why don't you put that sentence/solution on this page so we don't have to click that link article ID:193050? Phew! You say that this is "Tiny Footprint Mode". This is our BRAND NEW Dell desk top computer and not even 30 days old but we bought it from WalMart. How doe I get it off the "Tiny Footprint Mode"? Click through to the knowledgebase article referenced in the article you just commented on. Fantastic, just double click solve my problem. Thanks to everyone. WHY IS THERE EVEN AN OPTION TO HIDE THE FILE MENU BAR?? sheesh!!!! ty so much..I too was thinking this was a virus problem..double clicked and bingo..it fixed the problem.. Your amazing Leo, keep up the good work. Thanks a lot, Leo. I thought that someone had gotten into my pc and made changes. Your 'double-click' fix worked perfectly. I read every single one of your articles. Thanks so much for this. So simple, yet fixes a very frustrating problem! "† No, I don't know why it's called "tiny footprint". It's certainly not smaller; in fact, the displayed data takes up more, not less, of the display area. Perhaps the idea is that you can then resize the tiny footprint window to be significantly smaller and still display meaningful data." some tabs will become like.. zoomed in. just try it while being on the "performance" tab. instead of showing you the CPU load, RAM and swapfile usage and other details at the bottom, it'll only show the CPU load thingy, but in the whole window and not just a portion of it. Yeah. I have been trying to figure this out off and on. I can't help to wonder why MS does things like this. Everything is a big secret for them. I just laughed at myself after finding out that I just have to double click the side of it. Two thumbs up Leo!!! I checked other steps and they instruct to run sfc, etc etc. which they're making it hard for themselves to make it work. Hi, thank you so much for that quick and easy answer!! I thought I had a virus that my checker wasn't catching! You are awesome! Thanks for double click it works. I accidentally pressed something somewhere within task manager window and it just lost all "side" stuff. This is the 4th tip from you I have used today. My run command got disabled, regedit is blocked and task manager is blocked. You solved almost all of my problems. Thanks a lot. Thank's for that, it;s been driving me crazy. That's the stupidest feature I've ever seen in windows...Thanks for knowing the solution...you are now my #1 windows reference guide! Also going to download process explorer per your recommendation. Wow.. 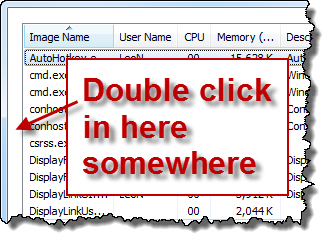 When I did the "double click fix" I felt just a teeny weeny bit dumber.. Ha! I searched for a couple of hours yesterday and just got on it fresh today. Ran across your fix after opening about three pages of runaround and cannot believe how straight forward and easy your site is. Leo! you stand way above the rest! * Oh, and to the fine folks reading this , if you feel it appropriate check out the "Tip Jar" at the bottom right of this page. I don't mean to be cheap but I'm in for a "Cup-o-Joe"
I thought my PC was hacked... and it was just this simple.. Thanks, I had no idea. It goes in to tiny mode depending on which tab you start out on it will be different. I was on the applications tab when it went to tiny mode. Thank you so much. You will think that this feature should be on the top of the form, not the side. Thanks Leo, I thought my PC was infected. I thought my pc has virus. You and google are Awesome! I had gone a few days wondering how to solve this problem. And then I took a whack at googling: "lost tabs on task manager window." Google even auto-suggested part of the query. You're answer was about 4 down on the first page of results, and was the first I chose, as the heading looked relevant. Just commented and wanted to add this. Too bad Microsoft doesn't give novice users a clue, like: "Double click window frame to restore tabs." And then: "[Click here] to hide this tip." for the advanced users. That could cure a lot of headaches. I had an issue with a Trojan that disabled my task manager, managed to find a solution using Google. This happened after that. Such a simple solution.. Not even something thats required.. Thanks for the simple solution. The power of double clicking. I feel so stupid. haha. Thanks so much. I am forever amazed and eternally grateful that the internet is full of experts who solve problems for free. I did get into tiny footprint mode by accident as described, and I had never heard of it before. Task manager looks very odd that way.